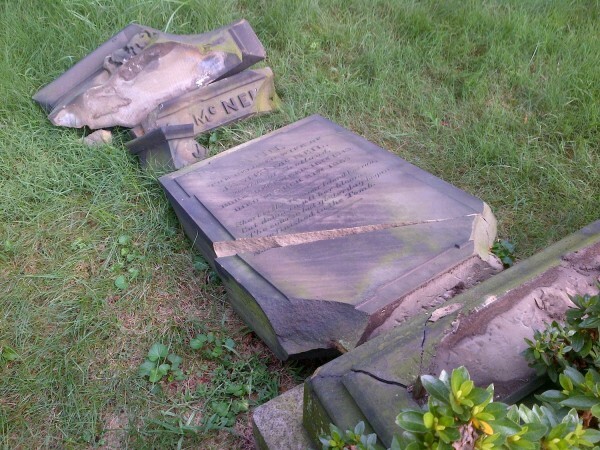 Dozens of tombstones and memorials have been vandalized at the Brooklyn’s historic cemetery the week of August 19, 2012, resulting in approximately $100,000 damages. According to the groundskeepers of the 19th-century Green-Wood Cemetery, more than 50 gravestones, plaques and statutes have been knocked down. Since its opening in 1838 it has never suffered destruction of similar magnitude. In 2006, the Green-Wood Cemetery was designated a National Historic Landmark. Many of the toppled stones date back to the 1800s. Mutilation of the statutes took place despite the fact that the grounds are protected by high cast-iron fence, video surveillance, and 24-hour car patrol of the grounds. Currently the case is under investigation by the New York Police Department Hate Crimes Task Force. 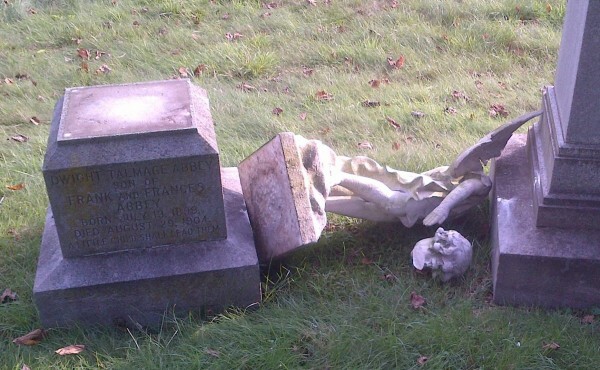 According to the cemeteries blog, Green-Wood is asking for help from the public to pay for repairs. According to the New York State Finance Law of 1988, there are funds under the joint custody of the state comptroller and the commissioner of taxation and finance to administer in instances of state cemetery vandalism and monument repair. It is unlike that the Green-Wood Cemetery would qualify for these funds because it is a private cemetery. The severity of criminal charges against the vandals depends on the cost of damages and means of destruction. Here, those responsible for the havoc would face 2nd degree criminal mischief charges for property damage, under New York Penal Law (NY CLS Penal § 145.10). Some historical information about the cemetery from its website: Founded in 1838 as one of America’s first rural cemeteries, the Green-Wood Cemetery soon developed an international reputation for its magnificent beauty and became the fashionable place to be buried. By 1860, Green-Wood was attracting 500,000 visitors a year, rivaling Niagara Falls as the country’s greatest tourist attraction. Crowds flocked to Green-Wood to enjoy family outings, carriage rides and sculpture viewing in the finest of first generation American landscapes. Green-Wood’s popularity helped inspire the creation of public parks, including New York City’s Central and Prospect Parks. Source: New York Daily News; Green-Wood website; images from: Green-Wood Blog.